OC Vaulting is committed to nurturing a supportive and positive community of exemplary athletes and horsemen through the sport of equestrian vaulting. 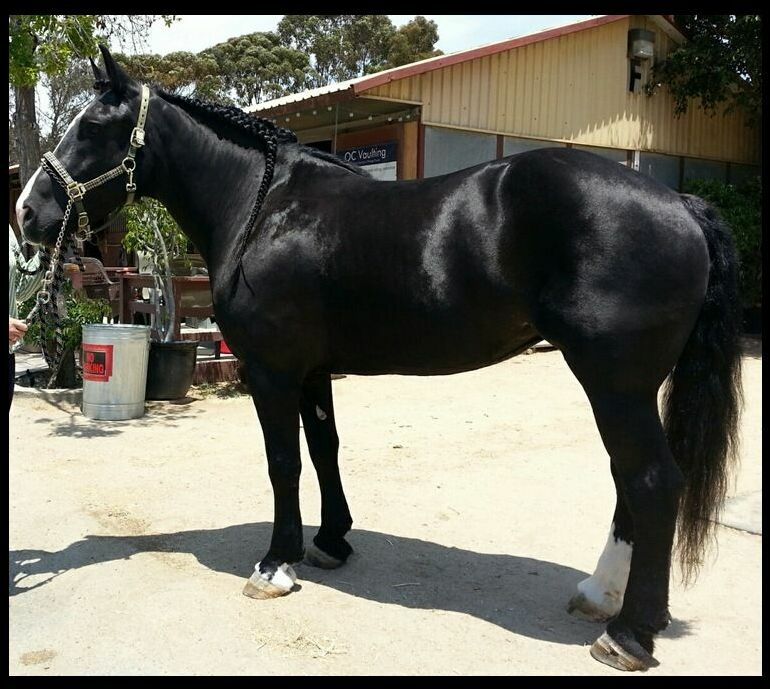 Gibran has ridden, shown & trained horses in Southern California since 1970. 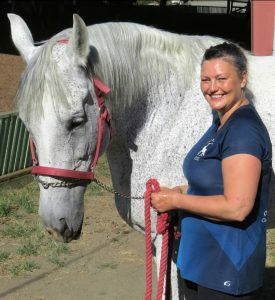 She loves both the harmony between vaulter and horse and the exceptional teamwork that is unique to this equestrian sport. 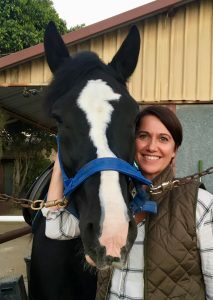 She also serves in the American Vaulting Association increasing awareness and participation in Equestrian Vaulting in the U.S. Gibran has lunged OCV into National Titles for Trot Team and Trot Pas de Deux in 2016 & 2017 and Trot Individual in 2016. Gibran is SafeSport certified. Entering the vaulting world as an adult, Alice’s martial arts and cheerleading skills give her great scope as a Vaulting coach. Alice is also a founding member of an all female martial arts stunt team. Sarah has been running for 20 years, racing as a long distance runner in high school and college. While racing in college she set several distance records at her University and achieved All-American honors in Track and Field competing at a National level. After college, her athletic interests expanded to outdoor rock climbing and yoga; she was certified as a yoga instructor in 2012. 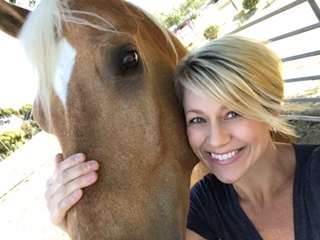 Introduced to vaulting as an adult, she loves incorporating yoga asana into her coaching at OCV. She is also SafeSport certified. 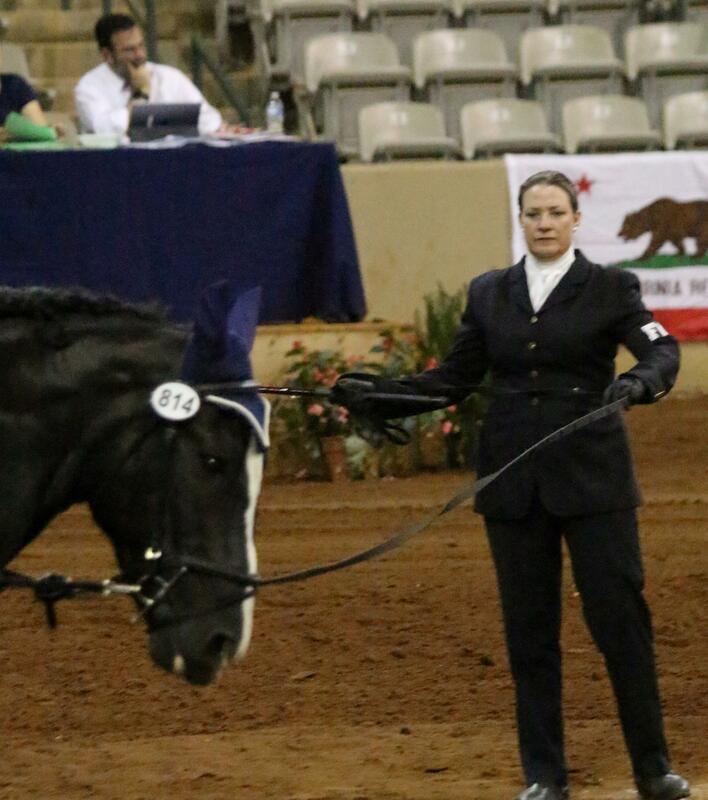 Sarah coached our 2017 Trot Team and Trot Pas de Deux to bring home the National Titles. 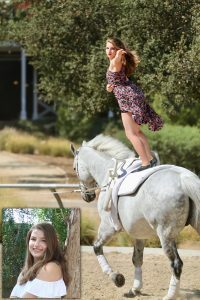 Elise began riding as a child in Denmark. She has had a life-long love of horses and shares her love by leading OC Vaulting’s AVA Horsemanship Program. Elise Gertrud is SafeSport certified. 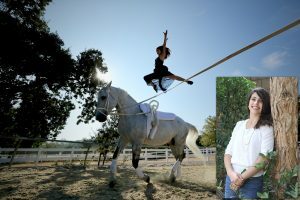 Wiebke started vaulting as a 4 year old child in Germany, where vaulting is often taught to young children as a preparation for future horseback riding. 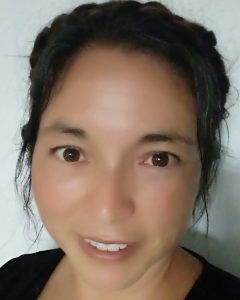 In addition, she has been competing in figure skating and team precision skating on European level and is owner of the German trainer C license. Wiebke found her way to OC Vaulting through her 2 daughters and is our Recreational Coach. It’s her goal to spark the love for our fascinating sport in beginning vaulters. She is SafeSport certified. Elna is passionate about her family, friends, nutrition, fitness and supporting her daughter’s love for vaulting. With that passion and a background in the entertainment and stunt business, becoming a coach for OCV was an easy choice. She loves being around this team that puts their heart and soul into supporting one another and doing their best. Giana began vaulting at the age of 8. She is a National Champion bringing home titles in Trot Team and Trot Pas de Deux in 2016, Preliminary (Canter) 2-Phase in 2017, and Preliminary (Canter) Pas de Deux in 2018. She loves sharing her knowledge and skills at OCV! Giana is SafeSport certified. 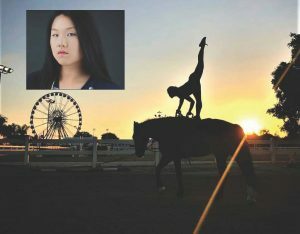 Jaden has been vaulting since she was 11 years old, and has loved horses for as long as she can remember. She is a National Champion bringing home titles in Trot Team and Trot Pas de Deux in 2016, Preliminary (Canter) 2-Phase in 2017, and Preliminary (Canter) Pas de Deux in 2018. 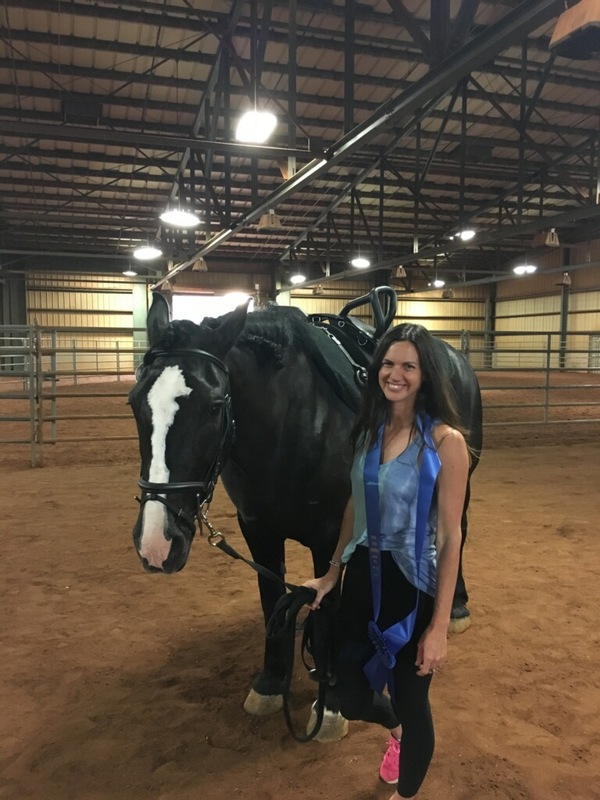 Jaden is passionate about her sport and loves sharing her knowledge in athletics and horsemanship through her coaching and vaulting! Jaden is SafeSport certified. 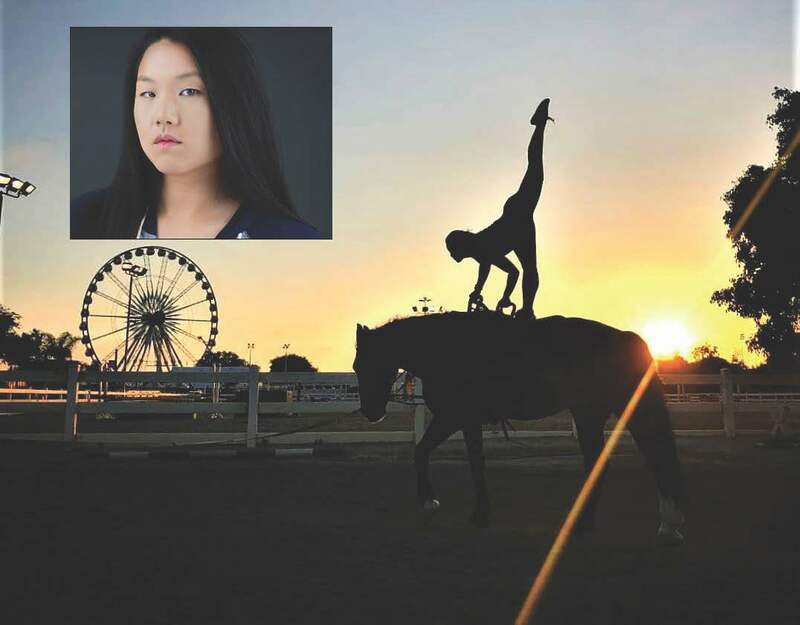 Gigi carried our team to five National Vaulting Championship Trot Titles in 2016 & 2017, as well as earning American Vaulting Associations Trot horse of the Year in 2016, 2017 & 2018. Her mother was a Belgian P.M.U. rescued by Diamond Bar Vaulters’ Connie Geisler. Gus is on loan to our club from Blue Sky Vaulters, in Iowa. He is 18 hands tall, and currently carrying our canter vaulters, as well as in training to be a Pas De Deux, and Team horse. He has a wonderful temperament, and is eager to learn. Jameson is our newest addition. 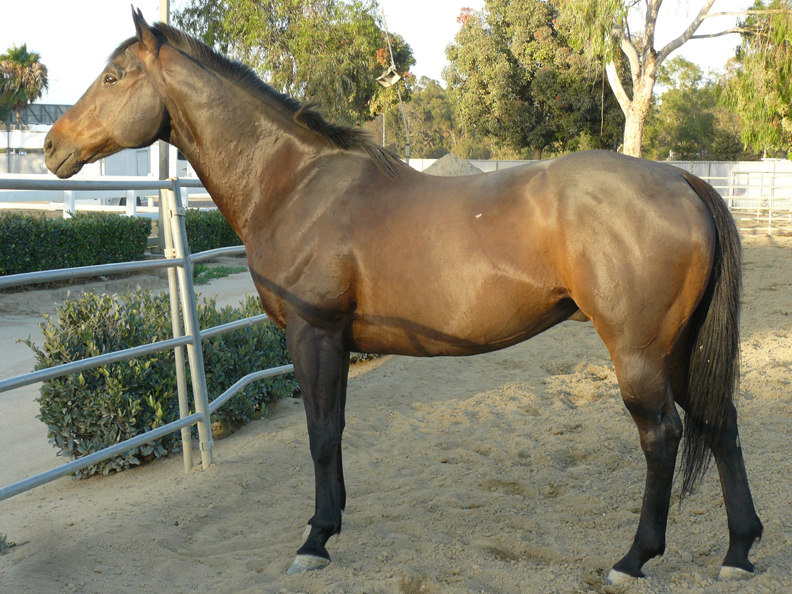 He came to us from Michigan, and is in training to carry our walk, trot and canter vaulters. He, too, has a wonderful temperament, and shows great promise. Guinness is a Canadian Thoroughbred. 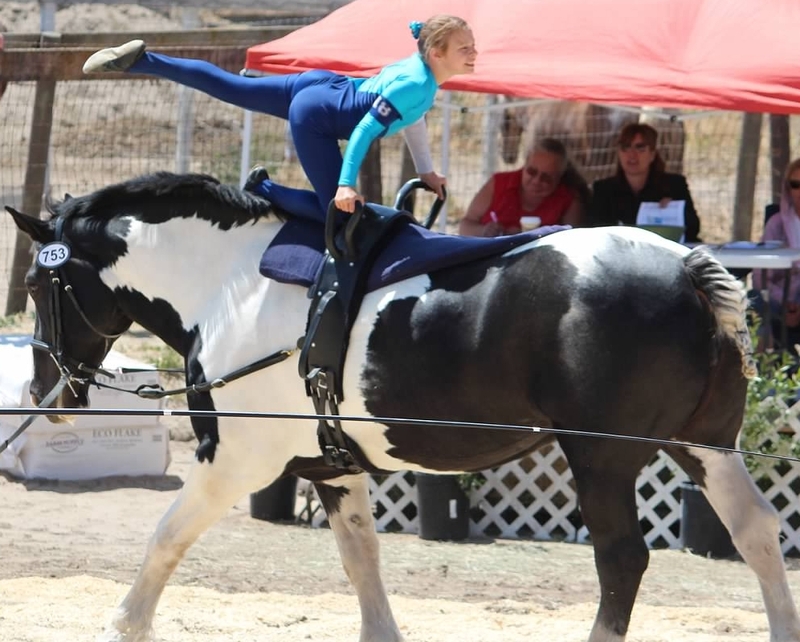 He was OC Vaulting’s very first vaulting horse, and still carries our “littles” as well as our riding classes. Betsy was a Spotted Draft and a favorite vaulting horse with our Club and all who knew her. We all miss her! Officially formed in 2013, OC Vaulting is a member of the American Vaulting Association. You can also visit OC Vaulting on Facebook. OC Vaulting brings home the 2018 USEF/AVA Vaulting National Championship Title in Prelim/Canter Pas de Deux! We are honored to also hold National Titles from 2017 and 2016, too! Safe Sport‘s focus is ending all forms of abuse in sport including when and how to report misconduct and how to recognize the signs in order to prevent abuse before it occurs. OC Vaulting requires Safe Sport training and adheres to its Policies. 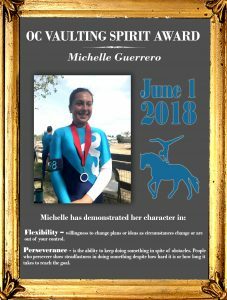 OC Equestrian Vaulting is a non-profit organization dedicated to promote the sport of Equestrian Vaulting. All donations are tax deductible. A portion of your Amazon purchases will support us! Make sure you use our special link.